Various things can affect the wear and life of wear parts during your first year of maintenance on your mobile mixer. Materials, slump of concrete, and the total amount of material put through the unit affect the wear parts and how often you need to change them. The first year schedule is one that the operator should watch with the daily, and monthly inspections. You will start to get a feel on how soon you will need to schedule and if that includes any down time. The operator should be inspecting and noting items that are showing wear or that need to be replace as he is doing clean up on the unit. IE: inspect the wear blades, belt wiper, mixer motor for leaks, lower and upper mixer bearings, and for concrete build up. The monthly inspection needs to be more detailed. Besides the mixer daily inspection the operator needs to have the unit empty and inspect the rest of the unit. IE: inspect the conveyor belt and tension, check side and center guide material and the gap between guide and belt. Adjust if needed. Adjust the conveyor belt wiper. It must be tight on the belting so it will clean the belt and stop material from slipping. They need to flush the admix system with water, and clean out the tanks. Inspect the water tank for any algae growth clean if needed and flush out any sand or stone that might have entered the tank. With these inspections you will start to see a wear pattern and can figure out a maintenance schedule. Depending on the materials and series of unit you can figure that the mixer will be the first component that will require repairs. Normally you should get 3,000 – 5,000 yards through a unit before you need the replace wear blades. You may need to replace the lower boot, and bearings. Again with the daily and monthly inspections you will be able to evaluate the components and make sure you have all parts needed. 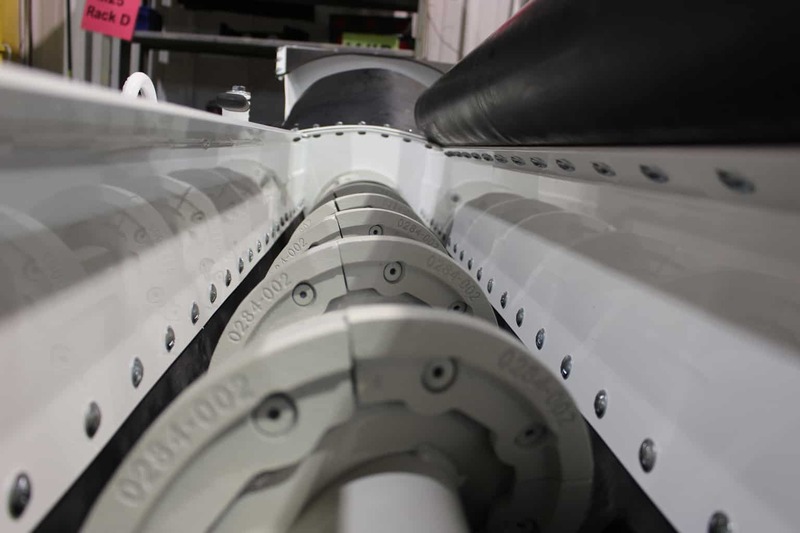 For the conveyor belt, with proper maintenance and care through the life of the assembly, you can expect to get 20,000 – 25,000 yards of life. This is one of the harder items to repair and will take the most time. Remember that all maintenance and life of the parts all depends on the work done up front through the year. Inspect regularly and you can plan maintenance to your schedule, not the mixer! For more information on what to expect during your first year of maintenance contact a Cemen Tech Concrete Solutions Specialist today or call 800.247.2464.